In the last issue of Retrievers ONLINE, we reviewed Bill Hillmann’s DVD on Fundamentals – Part 1 – Land. We noted that this was geared to those that followed Bill’s approach to puppy training. That approach and the procedures are becoming increasingly popular and for good reason. It is fun for pup and trainer, emphasizes basic skills, is a method proven by Bill and is effective, efficient and humane. The latter three traits are something I try for in all my training. Thus, my last two pups were trained “Hillmann style.” I was very happy with results. The first is an AFTCH at age 3. Many were asking about what steps to follow after Hillmann’s puppy DVD. Typical questions were, “Can I move into Lardy Total Retriever Training or Graham’s Smartworks or Stawski’s Fowl Dawg series or Farmer/Aycock’s Basics?” The answer was basically, “Yes!” I have personally followed a course of training closest to Lardy and so I knew that would work. I did note that there are some philosophy and procedural differences amongst Hillmann and the others. Thus, when his Fundamentals on Land DVD came out, it was a perfect opportunity for people to pursue the next steps – basically, ‘The Basics’, following the exact same philosophy. Those who read my review in the Winter issue will know that Bill planned two more Parts – one on Water and one on Marking. This review will describe Part 2 – Water. It was just released a few days before we went to press. I love the way Bill starts this one off. You might recall that I commented Bill hadn’t talked about marking in Part 1 but that I found out he was going to devote a whole separate DVD to it. Well, in this Introduction, Bill talks about the value of throwing marks for the youngsters while doing the Fundamentals. This is very important. Bill talks about the importance of attitude and the role of success marks and lots of birds. At the minimum, he would do a lot of what he calls “walking marks.” Anybody who has read Retrievers ONLINE or has my DVD, Training Retrievers Alone, will be very familiar with these. I have been doing them for 40 years except I have labelled them “Stand Alones” for a very long time. They are the same thing and I do them all the time with all levels of dogs. I also do Send Backs and Walk Backs but Stand Alones are, to me, the Bread and Butter. So, independently, Bill and I who train alone often have evolved into some similar procedures. What I was most interested in was where we diverged! Read on! Hillmann has 6 basic chapters in his water Fundamentals. They are Water-T, Swim-by, Power Cast into the Water, Cheating Singles, 7 Bumper Lining Drill in the Water and Walkout Blinds on the Water. I will describe each of these briefly in turn, as well as how or if they compare to other programs out there. Bill has included a small eight page set of notes with the DVD. It’s a nice condensation of key ideas. You can see a briefer version of it on his website at http://www.hawkeyemedia.net/fundamentalsWater.html. This step is a form of Pile Work on water. It conditions the dog to e-collar nicks to reinforce behaviour when sent, when en route and when being stopped and cast back. It also introduces casting for overs in water. This is valuable if you believe, as Bill does (and I do! ), that much teaching is done by handling. Bill reviews the Power Cast as taught on land before he goes to the next step which is Swim-by. Bill does Swim-by in a simpler and more helpful way than is conventional. While it is not mandatory that you do it this way it is an easy way, especially if you have never seen Swim-by taught by more conventional procedures. I think you will end up at the same place and perhaps with less trauma to your dog (although there should be no trauma with any method!) One area that Bill really emphasizes, and is not paid enough attention to, is the response to a dog’s behaviour when not “swimming by.” Bill really focuses on whether the dog is swimming by or looking at you and coming to shore. If the dog does look at you he gives the Power Cast (see next section). Otherwise, Bill is just very helpful with the dog getting the idea of the swim-by; lots of good footage and discussion here. In summary, Hillmann’s Water-T and the Swim-by are combined in many conventional programs into one step in Basics called the Swim-By. Bill has added some important details that others may or may not do. Bill’s Power Cast is essentially a silent over with an added nick. He explains how it is different than the usual reinforcement but, in the end when it is well conditioned, the over is reinforced whether silent or vocal. The silent cast becomes the command that is given with the nick! In many of the other programs that are Rex Carr based, there is no e-collar force on the over, only on the back. Hillmann’s program differs. But then, I remembered how I do Swim-by and a saying I heard second-hand about Rex’s swim-by. ‘If you have to say ‘No’ or blow the whistle on the Swim-by you have failed that Swim-by!” Yes, in Swim-by, I give a silent over and a nick if the dog looks at me to come in. I admit I hadn’t thought about this so much until I watched Bill. Just another example of how some of our training has converged independently. The section on Power Casts goes into considerable detail with explanations. Incidentally, throughout, Bill’s nick is very low level – he says a two-level often (on a Tri-tronics e-collar). In summary, the Power Cast is not in most conventional programs. This is something that is usually considered transition level work. Bill does it now using hand-thrown bumpers. His examples are mostly about angle entries around corners. He “corrects” immediately and often with a whistle-sit, nick (Indirect pressure). If you read the article earlier in this issue, you will see how I do formal water cheating lessons with a gunner starting with a simpler |_| -shaped entry. I do a lot of conventional de-cheating when training a puppy alone but I admit I don’t do these severe angles that Bill illustrates. However, Bill shows how to balance this work and how to make it a good experience. Thus, I have no argument with it for the dog that has been brought along as he suggests. This is the only place in the video where Bill introduces another helper. He shows how you advance cheaty water marks with the help of a thrower. Perhaps most people jump to this stage way too soon. Perhaps doing what Bill advocates will make it easier on the dog. In my case, I have also added some preliminary work – the most important being the Swim-by Tune-up that I described in the Spring issue of 2012. This drill was introduced in the Land DVD. It is a line of visible white bumpers retrieved at an angle. Atypically, from others, it goes from longest to shortest. Bill really focuses on this because he believes it really helps the dog focus. He emphasizes white targets in much of his young dog program. This is not because white is a crutch. It is because there are multiple whites and Bill is telling the dog which white to get. Often, there are other distracting whites. Bill introduced Walkout Blinds on land in Part 1. This is simply an extension on water. It is walking around a pond with your dog to place a bumper and then returning to the other side for the “blind” retrieve. You would have to be a brand new subscriber to Retrievers ONLINE not to know how much I do this with the youngsters and, in some cases, with my most Advanced dogs. In fact, I have been describing this procedure for a long time. It hasn’t been caught on by many pros, partly because of the time-consuming one-on-work. Some extremely successful Pros (such as Danny Farmer) don’t even do the prelude to cold blind steps that Lardy does, such as 3-leg Patterns, Blind drills and diversion work. They emphasize handling and they are good enough at it to be able to work a dog through cold blinds right after Double-T. Not many new Amateurs can do that! Earlier in this issue you can read an article on handling problems that I wrote before I got this DVD. There you will see explained the exact same procedure that Bill utilizes albeit I tend to do multiple walkout blinds with a dog at this stage rather than just one. I have for decades called these Walk-Around Blinds as opposed to Walkout Blinds. They are the same thing. Once again we converge. It’s a little unfortunate that everybody has their own label. It must be confusing for the newbie. I say Stand Alone and Bill says Walking Marks. I say Walk-Arounds and Bill says Walkout Blinds. BB Blinds to some are totally different than to others, including purpose; ditto for Tune-ups and Chinese drills and many other drills. The lesson? Be sure you know what the instructor means when he labels an exercise. It appears we will never have a common language. In brief, Bill’s Fundamentals are related to other programs’ Basics and Transition. His Water-T and Swim-by are what some just call Swim-by. His Power Cast into the water is not common and an add-on. The closest thing to it is the Cast into the Water drill which typically comes much later. His cheating singles are usually considered a Transition level drill but, on the other hand, few teach it alone with hand thrown bumpers. This is truly a Basics or Fundamentals exercise. His Walkout Blinds are not described in most programs, except Retrievers ONLINE; however, we do them routinely at the Transition level and consider them Fundamental. 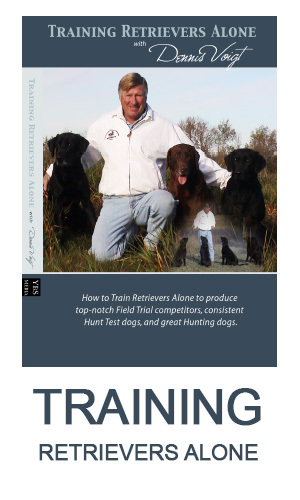 If you want to follow the philosophy and the approach of Bill’s highly acclaimed puppy DVDs, then the Part 1 and Part 2 (Land and Water) DVDs should be part of your library and study material. They are consistent in message. They are fun for both dog and the trainer IF you follow them closely. There are a lot of low level nicks in this program. Be sure you understand when and why they occur. There is a lot of practicing – don’t skip it. Be sure you are committed to that. There is also a lot of work alone – one-on-one. Be sure that fits in with your training group. I also want to add that I thought this production was very well done. Once again, that is the work of Mary Hillmann who did the filming and editing – a huge job! It is clean and shows the scene as if you were standing there watching Bill – who, incidentally, is talking to you as if you were there. It is very casual and one-on-one. Personally, I like the mood and the background guitar, but that is me! You can order this DVD and others at www.hawkeyemedia.net. The DVD sells at $149.00. It is almost 3 hours long but don’t fall into the trap of measuring DVDs by minutes per dollar. 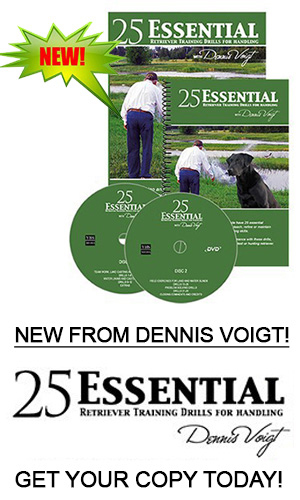 One of the best horse training DVDs I ever bought proved that to me! Postscript: I am really enjoying exploring new ways of training the youngsters. I have been inspired by Bill’s thoughts. My last two pups were so much fun to train and so responsive to these methods. My methods for Transition and Advanced dogs remain the same. Puppies can produce great fun, hope and promise if you can bring out the best in them. I am flush with dogs but just spoke for another puppy (see ad this issue) because of this fun, hope and promise. If you are in the same boat, consider Bill Hillmann’s puppy and young dog series to supplement your training information from other great instructors.